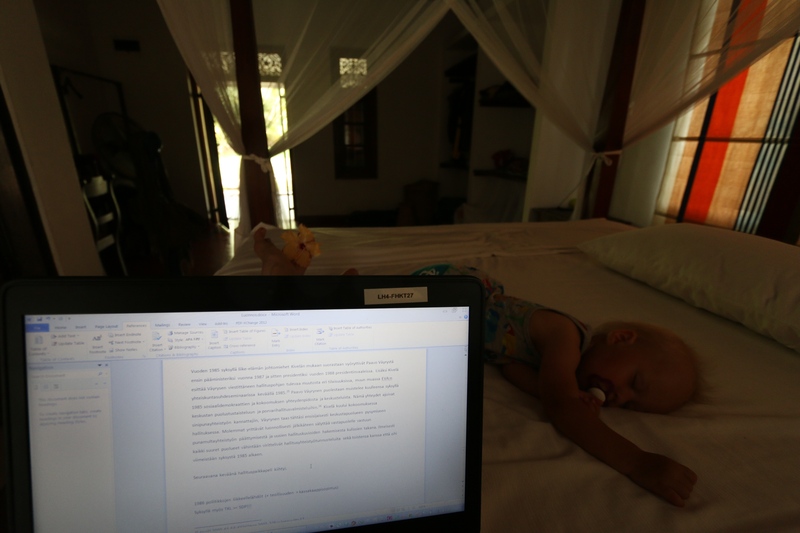 This is how Maiju’s typical work day goes here in Sri Lanka. At the Kandy House, the day begins with sweeping the floor upstairs from gecko droppings. I try to take this as a meditation exercise inspired by Japanese monks who rake the gravel in their rock gardens every day. After breakfast, it’s time for some concentration exercises with Eero as my personal trainer. While I try to write, he keeps yelling, getting into trouble and tugging at my sleeve for attention. This he does, of course, lovingly and in the best intention. He is only trying to help me build concentration skills so rock solid that the sky could fall without me noticing. My ghost writer. Am I going to get in trouble if University of Helsinki finds out? 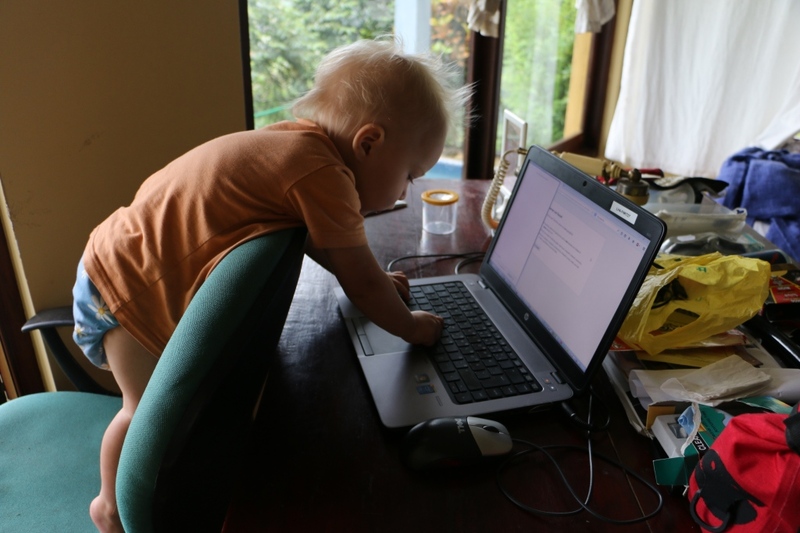 In the fornoon, the boys leave for one of their trips and I usually get a generous couple of hours undisturbed work time only disrupted by some Facebooking, random internet browsing (e.g. Googling for tips on how to get rid of mildew on EVERYTHING), writing emails and our travel blog, etc., etc. When the boys return, it’s already time for a lunch break and after that, weather allowing, for an afternoon stroll. You can’t just stay inside all the time and work, can you? And while you’re already out of the house, it’s only sensible to be on the move until the dusk and dinner time. After returning home in the evening it’s too late to work anymore so it’s time for relaxation and quality time with the the boys. Quite amazingly, I have been able to get some writing done on this trip. But small streams make big rivers, and I have been working at least a little most days, including Christmas. So I will return home with chapter 7 written (it’s nearly ready and I still have one week left), with chapter 8 (the last one!) well planned, and with a lot of ideas for introduction and conclusions. I guess that’s an okay accomplishment given the sometimes challenging working conditions and all the interesting things to see and do that lure me away from my writing.